This excerpt from the 2017 CBC documentary provides an up close look at Ojibway Prairie Complex's fireflies as they search for mates. This newsletter by J.E. 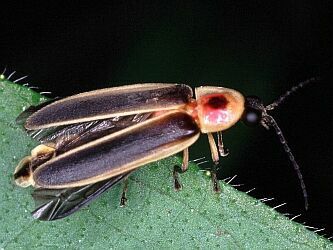 Lloyd of the University of Florida contains a wealth of information on fireflies. Millions of fireflies have been collected over the past 30 years for scientific and medical research. 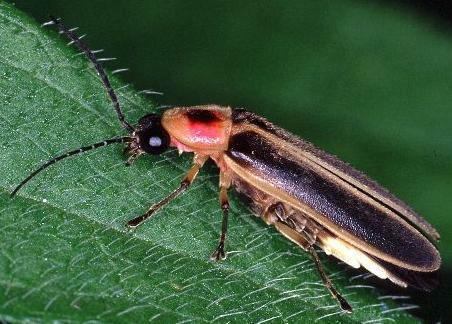 Firefly luciferin and luciferase is used to detect bacterial contamination in food, cancer research and may even be used to test for life on Mars. Fortunately luciferin can now be obtained through recombinant DNA technology. This species is found widely across eastern North America and is common at Ojibway in mid summer. It is often seen over lawns, meadows and other grassy habitats. Big Dipper Fireflies flash a distinctive pattern shortly after sunset for an half hour or so and usually fly less than 2 metres off the ground. The males suddenly rise in the air during their flashing producing a yellow "J" stroke. The flash lasts about a half second, the male pauses and then flies a short ways before repeating its performance. Flashes are produced every 5 to 8 seconds. Females remain perched in the grass and respond after 2 or 3 seconds with a half-second flash. The larvae of this species are subterranean and likely feed on earthworms. Larvae of the genus Photuris are surface dwellers, feeding on snails and other invertebrates. These are the most commonly seen "glowworms". All Fireflies belong to a family a beetles called the Lampyridae. About 180 species are found in Canada and the US. Some species do not produce any light as an adult beetle and some adult females cannot fly. The luminous segments of the abdomen can easily be distinguished by their pale yellow colour (as seen the above photo). All species have luminous larvae. A firefly's light is turned on or off by controlling the air supply to the luminescent organs. The chemical luciferin is instantly converted to light in the presence of a specific enzyme and oxygen. 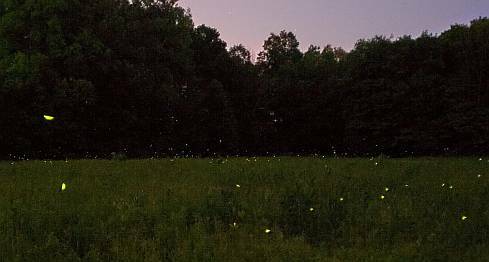 Fireflies produce green, yellow or orange light depending on the particular species. While some species of fireflies have declined in population the Big Dipper Firefly has probably benefited from the clearing of forests in eastern North America and is more widespread now than in historical times. Big Dipper Firefly showing the thin membranous underwings used in flight.